Visually, one of the most dramatic effect you can add to your reception is custom lighting. Previously, special lighting technicians had to be called in with special equipment to create these effects. Not any more. Laser Sounds can offer you many different lighting effects at reasonable costs. Uplighting is now the most popular light effect available. Uplighting can transform an average room into an amazing place for a relatively small price. Not only does it create a sense of elegance, but it also a great way to bring a themed color into your reception room. 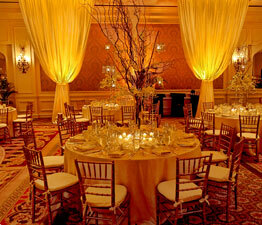 Uplighting can be a constant color or can change throughout the night. The price of uplighting depends on the number of fixtures required to create the desired effect. 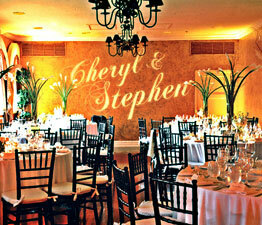 Another elegant effect that can be added to your room is a custom gobo or projected monogram. A gobo is a custom created image that is projected on a wall or dance floor. Typically for weddings, it includes the initials or names of the bride and groom. Cutting custom gobos used to be very expensive. through advances in technology, it is now much more affordable. Today’s wedding receptions are not complete without a montage video of your favorite memories. Let our team of multimedia experts create a custom video montage for you. Just hand over your favorite pictures and we will scan, retouch and compile them into a beautiful story of your memories. What sets us apart from our competitors is that each picture is individually scanned and retouched manually for the best possible output. You receive a copy of this montage on DVD. Finally, whether we produce your video or someone else, we can show your video at the reception for everyone to enjoy. Our projection services integrate perfectly with the audio equipment to ensure that the video and sound share your favorite memories in perfect harmony.